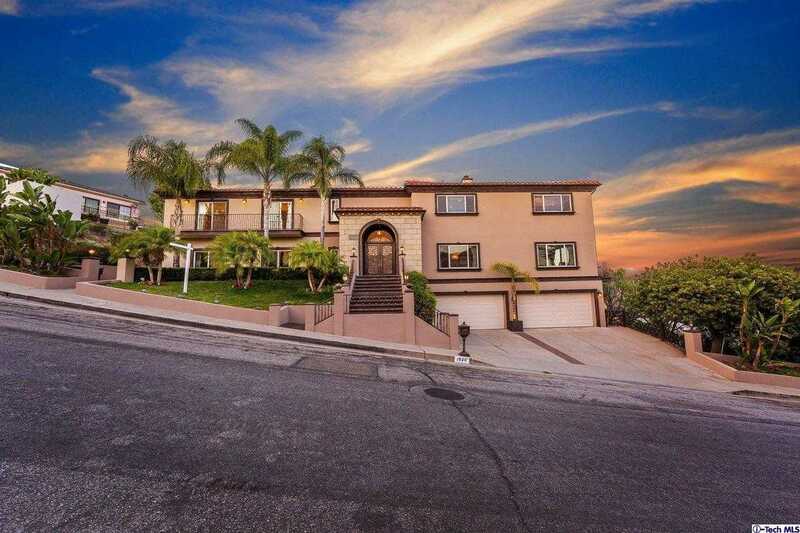 MLS# 319001188 – 1920 Starvale Road, Glendale, CA 91207 – Robbyn Battles | Battles Real Estate | JohnHart "Real Estate Redefined"
Nestled in the sought-after hills of Brockmont Glendale resides 1920 Starvale Rd! With impeccable elegance this Mediterranean Villa boasts 7992 sqft of luxurious living space, 7 bedrooms, 7 bathrooms & a 4-car garage. Upon entering the Iron clad double doors you’re greeted with immaculate Travertine/Hardwood flooring, crown moldings, recessed lighting, soaring ceilings & Ralph Lauren interior paint! Amazing Wine Cellar kitchen with bar stool seating, Zebra style Cabinets, granite countertops & GE stainless-steel appliances. Featured rooms included is a grand foyer, family room, library & a formal living room with a Marble fireplace all located on the main Level. The upper level has the laundry room, 5 of the bedrooms with Berber carpeting & balconies with mountain/Downtown LA city views. The Master (luxury hotel style) en-suite has an office/nursery, walk-in closet, plus a master bath with a Jacuzzi tub! Lower level features the Theater & game room with an entertainer’s private patio! Outside presents the ultimate backyard Smooth Stucco finish with custom exterior lighting, an automated Irrigation system, new pebble flooring with the Jacuzzi water falling into the pool, a gorgeous pool deck, Terrace patios & breathtaking majestic views from every angle! Building size: 7992 sq ft. Please, send me more information on this property: MLS# 319001188 – $3,795,000 – 1920 Starvale Road, Glendale, CA 91207. I would like to schedule a showing appointment for this property: MLS# 319001188 – $3,795,000 – 1920 Starvale Road, Glendale, CA 91207.